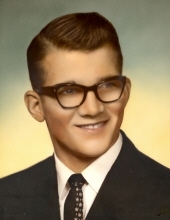 Frank H. Holschlag, age 75, of New Hampton, Iowa died Tuesday, November 20, 2018, at Linn Haven Rehab and Healthcare in New Hampton, where he had been a resident since suffering a stroke several years ago. A memorial visitation will be held in the spring of 2019. Frank H. Holschlag was born October 5, 1943, in New Hampton, the son of Clair "Skinny" Holschlag and Lora Mullen Holschlag. He was a 1961 graduate of New Hampton High School. He continued his education at the University of Iowa, where he earned a bachelor's degree and then a law degree. He returned to New Hampton and practiced law independently before joining William Wegman in the Wegman and Holschlag law firm. He also served as county attorney for Chickasaw County. On March 18, 1978, Frank and Arlene McDaniel were married in New Hampton. They had two daughters, Jaymie and Cydney. Arlene died in 1986. Frank was an avid reader. He also enjoyed woodworking, studying family history, and writing short stories. In his younger days, he trained horses and belonged to a trail riding group. He was a proud supporter of the Democratic party, both locally and nationally. Frank cherished the time spent with his family. He is survived by his daughters, Jaymie (Chris) Lowe of California, and Cydney Holschlag of New Hampton; a sister, Judith Willis Willette of Richfield, Minn.; family friend, Dustin Koska of New Hampton; and four grandchildren, SethHolschlag, Celeste Holschlag, Aiden Groth, and Emery Herrmann. He was preceded in death by his parents; wife, Arlene; and son-in-law, Tony Groth, in 2014. To send flowers or a remembrance gift to the family of Frank H. Holschlag, please visit our Tribute Store. "Email Address" would like to share the life celebration of Frank H. Holschlag. Click on the "link" to go to share a favorite memory or leave a condolence message for the family.